Buying gift certificates for the holidays makes your life simpler and people love to receive them! The giver's name and the recipient's name is left blank for an anonymous present. We can fill in both names and mail directly to the recipient if you so choose! Our Mystery Box is the perfect item for those who love living on the edge or love surprises! Our Gift Certificate. 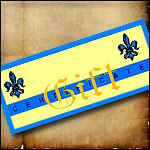 Buying gift certificates makes your life simpler and people love to receive them! The giver's name and the recipient's name is left blank for an anonymous present.